The summer of 2001, my mother and I went to the mall in search of wool sweaters. I was about to go to college in Oregon and word on the street was it was cold there, so my sandal-shod self, flip-flopped my way through the American Eagles and Pac-Suns of the Fairfield mall in search of pac-northwest worthy garb. For reasons still unknown to me, I made my way into Abercrombie & Fitch. Now, were this 1901, it would make sense, when it was an outdoor outfitters, more akin to the L.L. Bean than the Gap. However, it being 2001, Abercrombie was home to pre-frayed baseball hats and photos of men with hardly any clothing on, which always seemed like a terrible way to sell clothing to me. Regardless of any disregard I may have for the store, in I went and purchased my favorite sweater for the next 6½ years: a grey wool, zip-up hoodie. 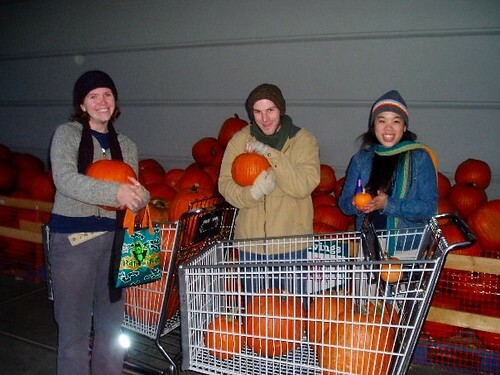 Me and my sweater on a "pumpkin patch" adventure in 2004. I loved that sweater, but the years of wear were starting to show. First the wrists started to unravel and loosen. Then the holes started to appear at the seams. When Mr. Cleaver pointed out a nearly two-inch hole in the right arm pit, I had to admit it was time to retire the thing. But having immersed myself in the world of craft blogs, I knew this was not the end. 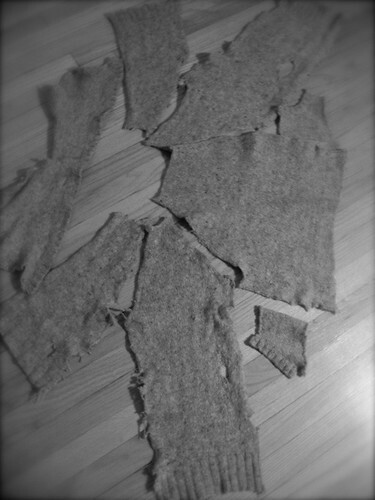 Yes, my old sweater could have a second life -- felted. 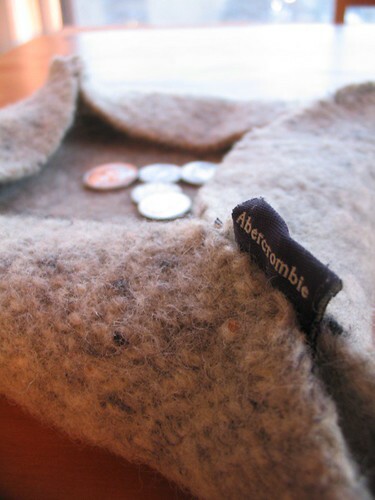 Now, my blogosphere doppleganger beat to me to the punch with this post on sweater felting/crafting, but I figured after 6½ years of warmth, my sweater deserves a blog entry as a send off. 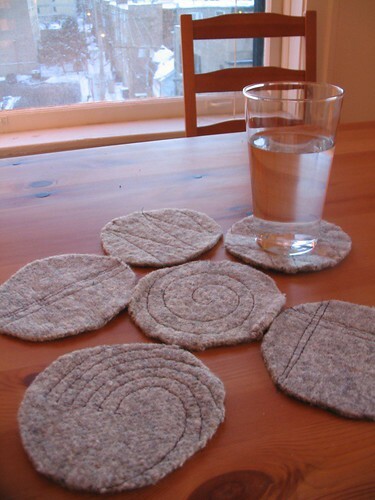 I was first inspired by these coasters I saw on Design*Sponge. Then I saw this fabric box linked on Sew Mama Sew and thought it would would be awesome in felt (like I said, I read a lot of blogs, my work day is slow). Yes, I decided coasters would be a dignified end for my favorite sweater. 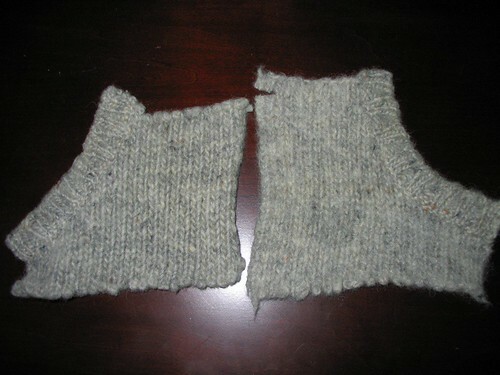 Original sweater on the left, felted on the right. Wasn't this thing supposed to shrink? 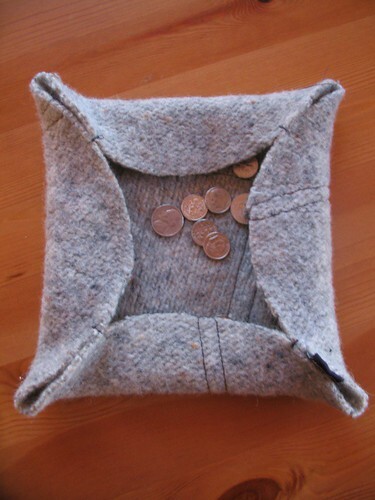 But before I could make coasters I had to felt the sweater. This proved more difficult than one would think. I mean, everyone is always saying "Don't put your sweater in the washer or dryer or it will only be fit for your Chihuahua!" The first two times I washed and dried this (both on high temps, mind you) it just got clean and fluffy. On the third try, it got a little felted. At this point I gave in and did it by hand, with the above results.